SCANTY GELA: Scanty Gela BLOG - Writers Club: [Policy, Instructions, Terms and Conditions] read carefully. Scanty Gela BLOG - Writers Club: [Policy, Instructions, Terms and Conditions] read carefully. We know writing can be lonely work, so we decided to invite anyone that loves to write for fiction and nonfiction articles or any relevant contemporary post. Participation in the Club helps build a community where writers can gather for inspiration and support, exchange critiques, keep in touch with fellow writers, or just to chat about contemporary issues. You can register or unregister whenever you like by writing to writers@scantygela.com . When your registration is accepted, you'll receive a customized yourname@scantygela.com email address with instructions on how to use it. NOTE: We are still in beta [testing] stage but once the Club kicks off properly, your custom email address is the only email we will accept articles or write-ups from. How many writers club are there in EMU/TRNC? Currently we are unaware of any. That is the main reason the SGB Writers Club is being formed to give you wonderful writers out there a platform to freely express your talent/writing skills and also get to meet other amazing writers. You never can tell where this may lead. Open doors and windows can happen at anytime, if you believe. Anyone can join who enjoys writing and would like to interact, meet and talk to other writers, receive feedback on your work, and comment on the work of others in a supportive, friendly environment. You can request to have your writings removed from the blog at anytime and your membership terminated. Simply send an email to writers@scantygela.com stating why you want to leave us. In as much as we will honour your request, we'll be sad to see you leave. You would also be expected to forfeit the custom email address initially given to you. Nothing; the Club is free to join but there are many benefits to enjoy as a writer. These will be explained below. What are the benefits of becoming a Scanty Gela Blog writer? Apart from the massive exposure writing for SGB will give you and your amazing work [the Blog gets over 8,000 unique visitors daily from all over the world with most visitors coming from Cyprus, Turkey, UK, USA, Nigeria, Germany and the rest of the EU]. The Blog also has confirmed organizational readership and subscription from the Royal Commonwealth Society [ www.thercs.org ] and the United Nations, including several higher institutions and universities. This gives your work an immense exposure. Also, you get to be among an elite group of innovators and intelligent minds that can help you in any way imaginable. 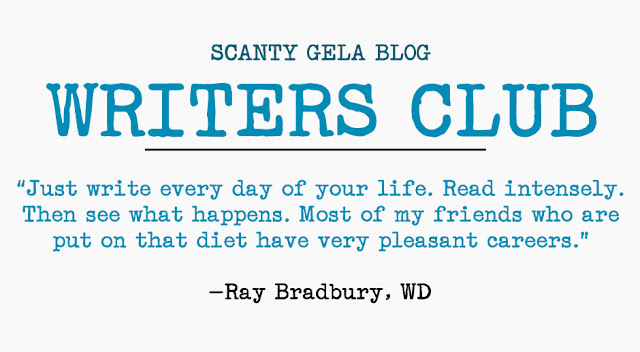 Scanty Gela Blog Writers Club is a place where writers and aspiring writers can gather for support and inspiration, discuss writing and writing-related topics, make new friends, keep in touch with fellow writers, and provide comments and suggestions for each other's work. Lastly, you get free VIP invites and treatment to any Scanty Gela Blog or SGB-partners related events and the likes. Occassionally cash rewards are given by our sponsors for best writers as a form of motivation and support. What kind of activities DON'T take place in the Writers Club? If you're selling something, want to educate people politically, evangelize [except spiritually uplfiting articles, without forcing someone to join your religion or accept your belief...], or rant, we do not accept those here. This Club is for writers and aspiring writers and are about writing on contemporary and conventional issues. Spammers, flammers, and other disruptive elements will not be tolerated and will be removed from the Club member list. What if i want to start my own Writers Club or Blog? Members are encouraged to think outside the box and not limit their potentials to just writing. Scanty Gela Blog duely respects anyone that wants to quit and start their own endeavour. We are merely providing an already established platform to help writers and aspiring writers out their get their work in front of a larger wider audience.